For the luxury train that ran in New Zealand, see Silver Star (NZR). The Silver Star is a 1,522-mile (2,449 km) passenger train route in the Silver Service brand operated by Amtrak, running from New York City south to Miami, Florida via the Northeast Corridor to Washington, D.C., then via Richmond, Virginia; Raleigh, North Carolina; Columbia, South Carolina; Savannah, Georgia; Jacksonville, Florida; Orlando, Florida; and Tampa, Florida. The Silver Star shares much of its route with the Silver Meteor, however the two trains diverge between Selma, North Carolina and Savannah, Georgia and between Kissimmee and Winter Haven, Florida. Between Selma and Savannah, the Silver Star takes an inland route to serve the Carolinas' state capitals of Raleigh and Columbia, while the Silver Meteor stays closer to the coast and services Florence and Charleston, South Carolina. Between Kissimmee and Winter Haven, the Meteor takes a direct route with no intermediate stops, while the Star takes a detour through Lakeland and Tampa. During fiscal year 2018, the Silver Star carried nearly 368,518 passengers, a decrease of 1.3 percent over FY2017. In FY16, it earned a total revenue of $29,261,496, an 11.6% decrease from FY2010. The Star was originally a service of the Seaboard Air Line Railroad, running from New York to Miami and later also St. Petersburg (beyond Tampa). It was inaugurated December 12, 1947, to replace the Advance Silver Meteor. 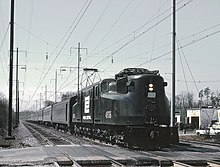 The Pennsylvania Railroad carried the train between New York and Washington, D. C. under a haulage agreement, similar to the arrangement with its sister train, the Silver Meteor. The agreement was maintained when the Pennsy was folded into Penn Central in 1968, a year after SAL merged with the Atlantic Coast Line Railroad as the Seaboard Coast Line. Amtrak took over the train in 1971. With the exception of a brief period from 1994 to 1995 and from 1996 to 2004, when service to Tampa was provided by the Palmetto (known as the Silver Palm from 1996 to 2002), the Silver Star has served both Tampa and Miami during the Amtrak era. Originally, Amtrak operated the Silver Star with Tampa and Miami sections that split in Jacksonville, with the Tampa section continuing on the old Atlantic Coast Line route through Orlando, and the Miami section traveling through Ocala and Wildwood over most of what was the original Seaboard route to Miami. After November 1, 2004, the Silver Star resumed service to Tampa, and now travels intact all of the way, backing out of Tampa and retracing its route 40 miles (64 km) east to Auburndale, where it heads south to Miami. In the January 2011 issue of Trains magazine, this route was listed as one of five routes to be looked at by Amtrak in FY 2011 as the previous five routes (Sunset, Eagle, Zephyr, Capitol, and Cardinal) were examined in FY 2010. On February 4, 2018, Silver Star train number 91 collided with a CSX Freight Train in Cayce, South Carolina, killing both the engineer and a conductor and injured 116 more. 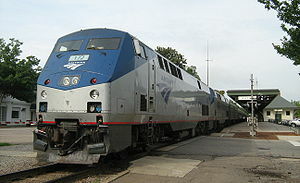 Like Amtrak's other long-distance routes that operate to and from New York City, the Silver Star is restricted to its single-level Amfleet and Viewliner cars. Between New York Penn Station and Washington Union Station, the Silver Star is pulled by one Siemens ACS-64 electric locomotive. South of Washington, one GE P42 diesel locomotive pulls the train. Since July 2015, the Silver Star has operated without a dining car. Passengers must buy their meals from the lounge car, which serves hot and cold food, albeit from a more limited menu. During the winter months, the Silver Star sometimes adds additional cars to accommodate increased demand. These longer trains forced delays in Amtrak's long-planned move to a larger station in Miami. Central Florida Rail Corridor: DeLand–Poinciana. In its present form, the southbound Silver Star leaves New York just before lunchtime, arriving in Washington in mid-afternoon and Raleigh in mid-evening, then passing through the Carolinas and Georgia overnight before arriving in Jacksonville at breakfast time the following morning, Orlando in mid-morning, Tampa at lunchtime, and Miami at the end of the evening rush. Northbound trains leave Miami just before lunchtime, arriving in Tampa at rush hour and Orlando in early evening, passing through Jacksonville, Georgia and South Carolina overnight before arriving in Raleigh at rush hour the following morning, Richmond at lunchtime, Washington in mid-afternoon, and New York in early evening. Prior to October 1986, the train ran between Petersburg, Virginia, and Raleigh via the CSX (Seaboard Coast Line) Norlina Subdivision, stopping only in Henderson. CSX abandoned the Norlina Sub between Norlina and Collier Yard in Petersburg in 1986, and the Silver Star was shifted to the "A Line" between Petersburg and Selma, then to NS's "H Line" between Selma and Raleigh. Like other long-distance trains, passengers are not allowed to travel only between stations on the Northeast Corridor on the Silver Star. Northbound trains only stop to discharge passengers from Alexandria northward, and southbound trains only stop to receive passengers from Newark to Washington. This policy is in place to seats available for passengers making longer trips, and also due to the availability of the more frequent Northeast Regional service. In the movie Carlito's Way (1993), Al Pacino's character is killed just before boarding the Silver Star. ^ "Amtrak Sets Revenue and Earnings Records Delivers Best Operating Performance in Company History" (PDF). Amtrak. November 16, 2018. Retrieved February 2, 2019. ^ Cite error: The named reference FY2018 was invoked but never defined (see the help page). ^ "Amtrak FY16 Ridership & Revenue Fact Sheet" (PDF). Amtrak. April 17, 2017. Retrieved February 3, 2019. ^ "April 6, 2004 (System Timetable) Page 71". The Museum of Railway Timetables. ^ "Atlantic Coast Service Timetable - Effective November 8, 2010" (PDF). Amtrak. ^ "Amtrak's Improvement Wish List", Trains, January 2011, 20-21. ^ Fedschun, Travis (February 4, 2018). "Amtrak, CSX train collision in South Carolina leaves 2 dead, over 100 injured, officials say". Fox News. Retrieved February 4, 2018. ^ Joseph, Yonette; Bolon, Anne-Sophie (January 31, 2018). "Amtrak Train Collision Kills at Least 2 and Injures Nearly 70 Others". The New York Times. Retrieved February 4, 2018. ^ Chardy, Alfonso; Viglucci, Andres (October 31, 2013). "Long trains, short platforms at new Miami airport train station won't force permanent street closure". Miami Herald. Retrieved August 10, 2016. ^ "All reserved on the 11:30 Amtrak Silver Star bound for Tampa and Miami - Carlito's Way". Subzin.